To reach us by "text" please click the "text icon" messaging and data rates may apply. We specialize in recovery of past due commercial debts and commercial credit consulting. The main office is located in Glendale, California (Los Angeles) with additional offices in San Francisco, Seattle and Baltimore. The Los Angeles office is headed by President Robert Norman Merette and Vice President/General Manager Rhett T. Tallas. The top level management in CCG is unique in that all principals have been involved in commercial debt recovery their entire adult lives. Both the agency and the principals are involved in all local and national governing bodies and trade associations for the commercial collection industry. 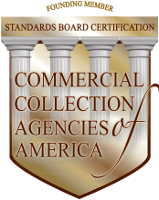 Bob Merette is a member of the Commercial Collection Agency Association. The agency is also active with the American Collectors Association and the California Association of Collectors. The Continental Commercial Group team specializes in hands-on management in the marketing, collection and credit consulting areas of our business.